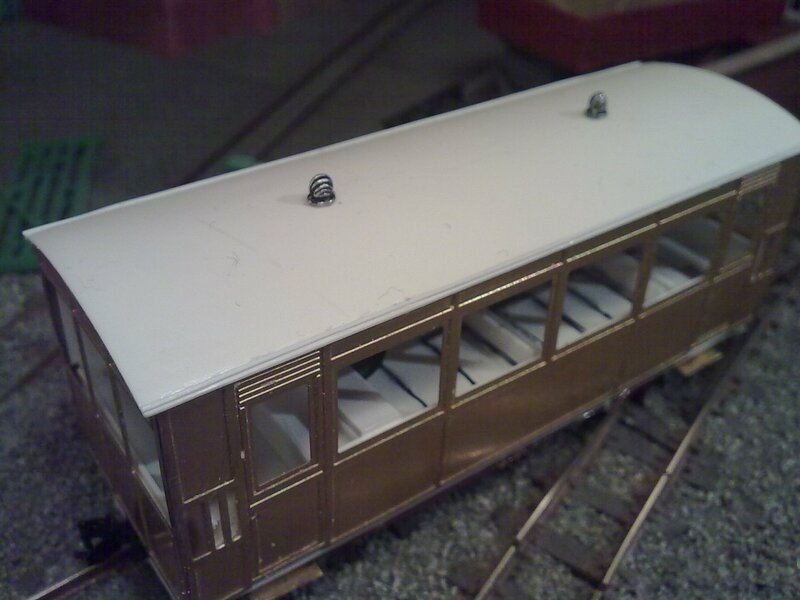 I've just completed the final details, so the railcar is now ready for painting. Well, it needs a good clean and polish first, but there's not much point in doing that until I am ready to paint it! The trouble is, I don't have any etch primer and I'm not sure my usual Halfords primer will be the best for brass, so painting might be a little delayed. 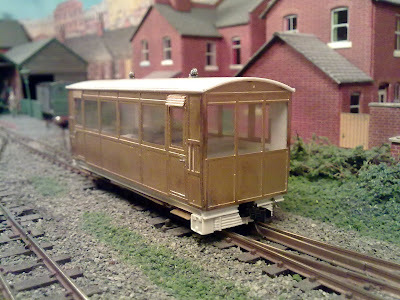 taples), the ventilators over the doors (from the etch), a battery box and more unkown rodding under the side shown, and a starting handle on the "front" (right of coupling in the lower photo). The glazing cut previously was trimmed to clear door-handles and roof and slid back in (of course it will be removed for painting). I did wonder about putting driving controls inside, but since they are not visible in photo's and I am not sure where they would be, I thought better not to guess and get it wrong. However I will also need to amputate the legs of some passengers! So final verdict on the kit? 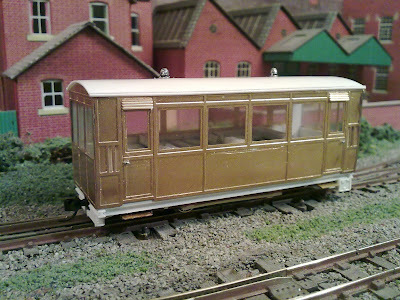 Well I am still not a fan of brass, plastic kits are much easier and to my mind, the results just as good. Also the description of a "scratch aid" kit is spot-on, although the sides are nicely etched and you don't have to cut the windows out, the rest of the model has to be scratch built, and to build anything approaching the prototype research is required too. I have found a lot of help on the NGRM forum as well as through comments on this blog, a real benefit of the internet! But for models of less-well known prototypes the Worsley Works range are a big bonus. That said, while it has not been an easy project, it was not exactly difficult either, just challenging enough to make it interesting and enjoyable. I have managed with standard tools found in just about every modellers toolbox, and my average skills, and has taken a couple of months at my sedate pace of about 3 evenings a week, so it should not be beyond the capabilities of anyone with a little kit-bashing experience. It's been fun, and has resulted in an attractive and unusual model I think! Now, what colour to paint it? OK progress has been interrupted a bit lately, but I have completed the roof! ... no not more tea! Here's how it is done. 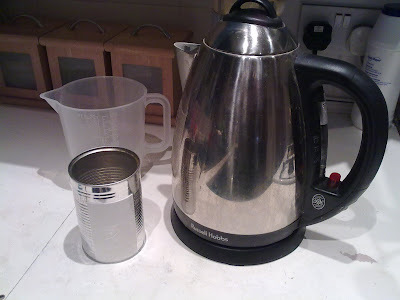 Put said tin into jug and pour in boiling water. Allow to stand for a while (now have your tea!). 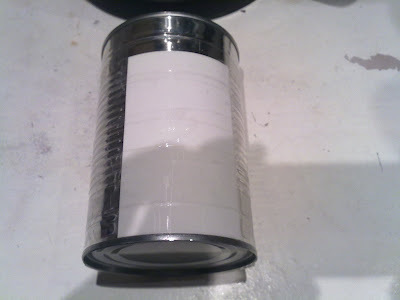 Empty away, rinse in cold water, and then remove the tape. Hey presto, curved plasticard! Simple but effective, and not my idea - I've done it before but can't remember where I first hear about it. This tin was pretty close to the right radius, slightly too tight, which is fine as it is forced to the right radius later. I said two pieces of plastic were bent - one was trimmed to the roof size with slight overlap over the bodysides, the other cut to fit just into the bodyside, then the two were cemented together - there is no way that bend is coming out! To make it even stronger I cut a piece of 40-thou plastic to fit inside the body like a ceiling, and - here's the fiddly bit - 4 small pieces to the curve of the roof to act as "ribs" like this: ( - which were glued to the false ceiling, then the curved roof stuck over the top. It is now really solid, and exactly the right radius! It is a faily tight fit into the body and helps hold the sides rigid, especially when being picked up, when painted a spot of PVA will hold it in place such that it could be prised off if needed. Finally I found some lamp ventilators in my bits box - whitemetal castings of unknown origin - and added a couple as per the photo's I have. Also some fine microstrip makes the rainstrip along the edge of the roof. 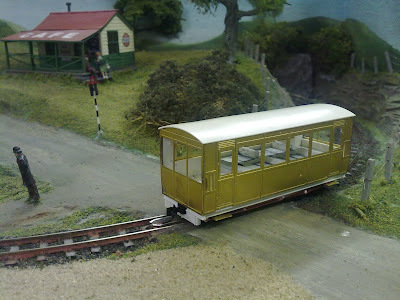 Railcar - Tackling the underside! 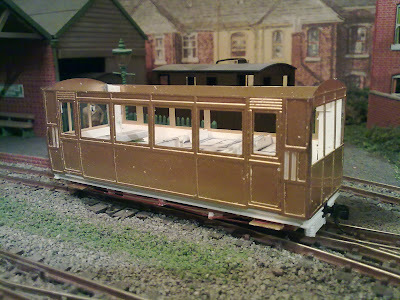 Recent progress with the railcar has focussed on the underframe and all detail below the body. This has highlighted that as a "scratch aid" kit there is an awful lot of scratchbuilding involved! First two layers of 40 thou plastic plus further packing has been added below the floor, which had been set further up the body to get the chassis the right height. The plastic extends slightly below the lower beading as per the photo's I have. Then an underframe was added from plastruct "H" section - allowing for couplings. The very distinctive radiators under the ends were made from plasticard scored with a razor saw, giving the grille effect, then detailed with microstrip strapping, though they have been cut around the coupling. 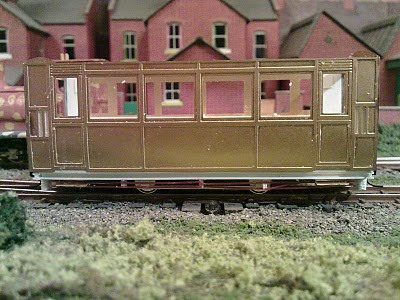 The Kato chassis has had as much of the "N-gauge" detail removed as possible, but the plastic frames hold the wheels and motor in place so care was taken not to weaken them. Very simple detail was then added for W-irons, axleboxes, and truss-rods, from plastic. Not much of this will be visible! Incedentally the chassis is now a fairly tight fit into the plastic hole left under the body! Much thought was given to the steps - although the prototype has two steps to each door, I settled on one, as this model has been built lower and on smaller wheels than the prototype. I was also concerned that lower steps might hit platforms, as well as being very vulnerable! The steps were made from off-cuts of the brass etch and soldered to springy wire, which was then bent to suitable supports and glued into holes in the floor behind the solebars. Hopefully this would make them robust enough! 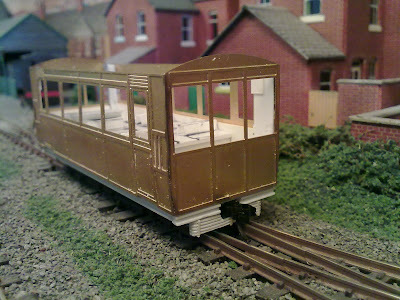 Finally the prototype railcar has some unusual and distinctive rodding (or pipework?) along the side of the chassis, I think these are controls to the driving positions but I'm not sure. Since they are always in shadow, and hard to see clearly on prototype photos, I have made a representation from micro-rod. 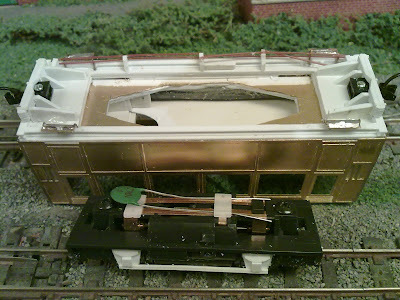 This view of the underside of the body, and the chassis removed, shows the basic detail on the chassis as well as the plasticard packing under the body, supports for radiators and details, the brass and wire steps, and how the Microtrains couplers are screwed into place - they can be removed for painting.